Although it is only a small part of the RSPB landholding in the Ouse Valley, Berry Fen is, in my mind, one of the most exciting parts of the reserve. It was my first ‘port of call’ during a tour of Ouse Valley sites, a tour that included Ouse Fen and Fen Drayton and saw me connecting (eventually) with a third Red-footed Falcon in a little over a week and a mass of newly emerged Scarce Chasers. 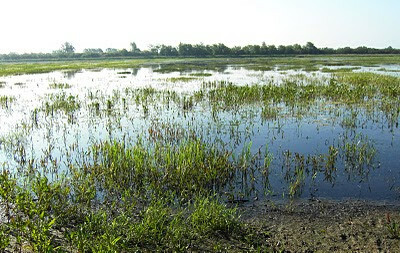 Berry Fen is a small wetland adjacent to the River Ouse. Unlike many reserves, the water is deliberately not controlled, it is a floodplain washland; wet when the river is high, dry when it is low. Two years ago it was very wet in the spring (and attracted a lot of birds), last year it was dry, this year it is wet again. In the wet years it is heaving with breeding duck and, as it dries out, the muddy edges are ideal for breeding and passage waders. This irregular wetting pattern makes the site far more productive than if it was wet every year – not always easy to get across when birders complain that the site is dry. Berry Fen will not be good for birds every year, but when it is wet, it has the potential to be very good.